The classic solid yellow gold figaro chain necklace: a flat, diamond cut chain that everyone loves. A solid style to wear as a standalone item, or from which to hang a precious pendant. Shop our super range of Figaro chain necklaces for men and ladies below. Hallmarked gold Figaro chain necklaces delivered quickly and securely via Royal Mail. 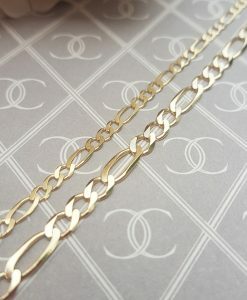 After the curb chain, the gold Figaro chain is a best seller here at Chains of Gold. Much like the curb, the best Figaro chains are made in Italy, where the chain styles was almost certainly invented and named after the popular operas of the day. Figaro chains feature short round flat links usually 2 or 3 in number, followed my a much longer oval link. This 3-1 design is repeated throughout the length of the necklace, giving it a decorative look that is not over the top. Links tend to be diamond-cut (bevelled), and so reflect the light beautifully. This low-key yet striking design makes the chain a popular choice for men as well as women, and means the Figaro chain looks great both worn solo or with a treasured pendant such as a cross or crucifix. Both our gold and silver Figaro chain necklaces are manufactured in Italy and imported into the UK where they are tested and hallmarked. We stock yellow gold Figaro chains, white gold Figaro chains and a chunky men's silver Figaro chain necklaces. Our range of Figaro chains is ever expanding and we hope to add more styles soon. We stock lengths from 18 inches to 28 inches, and widths from the very discreet to the more substantial. We deliver all of our Figaro chain necklaces worldwide, free of charge. We regularly ship to USA, Canada, Australia, New Zealand and the European mainland. All of our Figaro chains come with sturdy lobster clasps and a 1 year manufacturer's warranty. The Figaro chain necklace is a classic item of jewellery, a jewellery box staple and a style that is unlikely to ever age. We find them popular jewellery gifts for him and her, and all of our Figaro chains are sent beautifully gift wrapped. If you are UK based, returns are free, should the recipient find the chain is not for him or her.